Justice Kavanaugh’s confirmation to the Supreme Court leaves a vacancy on the District of Columbia Circuit Court of Appeals, giving President Trump the opportunity to put another constitutionalist on one of the most important benches in America. The president has nominated Neomi Rao to fill that post. 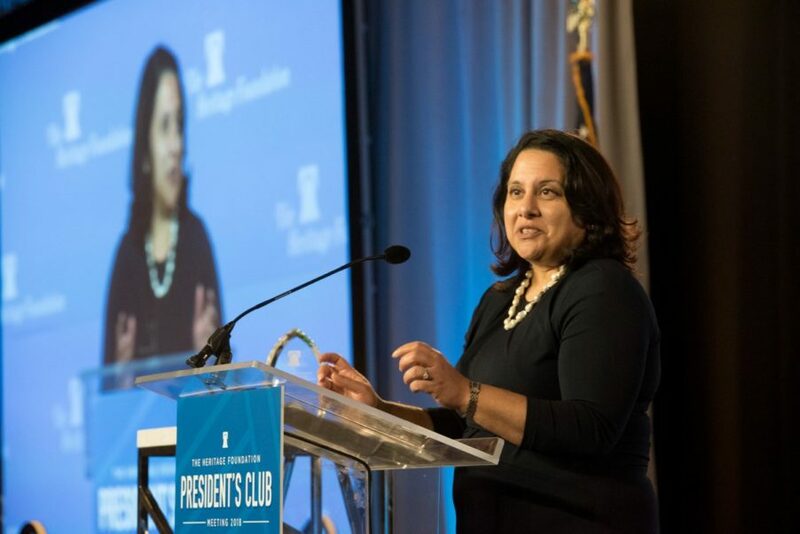 At age 45, Neomi Rao is a rising star in the conservative movement. She clerked for Justice Clarence Thomas, then went on to distinguish herself as the founder of the Center for the Study of the Administrative State at George Mason University’s Antonin Scalia Law School. Currently she serves as the administrator of the Office of Management and Budget’s Office of Information and Regulatory Affairs. In her current role, Neomi has led the Trump administration’s tremendously successful effort to rein in the regulatory state, rolling back 20 regulations for every new regulation added to the books. Neomi was recently honored with The Heritage Foundation’s 2018 Distinguished Intern Alumni Award for her remarkable achievements since interning at Heritage. The DC Circuit is known as “the farm team” for Supreme Court nominees, and if confirmed, Rao would surely be a future contender. Your investment in Heritage empowers us to mentor gifted young people that impact their generation, as Neomi Rao is doing right now, and as so many in our Young Leaders Program will do in the future. Thank you for making Heritage the place where young leaders can rise and achieve great things for America. If you were rating President Trump on his judicial nominees, what score would you give him and why? President Trump is always positive, never lets others bring him down. He does pick the right person for the right job. May God always bless him. I would score President Trump an A++ for his judicial choices! This gives me some hope for the future of this country that there will be judicial wisdom influencing these courts future decisions. sp?) nominations, I would give him high marks. selections have been awesome! Thanks to all concerned. Both my husband and I (Jim Rego) are very pleased that President Trump has been successful with his nominees for the Supreme Court, etc. We need Judges who will follow the law and know and can apply the Constitution of the United States the way it should be applied! We are tired of all the fighting among our “democratic” system by both the Democrats and Republicans. Sometimes it seems our elected politicians don’t think about the actual state of our wonderful country. Why not work together for the good of our nation, rather than concentrating on their own personal goals and desire for more power, without being able to evaluate importances and really do their jobs! We know not all legislators are in this category, but sometimes it feels like we have no true representation from anyone! President Donald Trump is leading our beloved America with his hand held by our GOD and following HIS guidance in everything important to the American people and to our United States of America. Walk in God’s grace dearest Donald and all who believe in our America, under God, always Amen. I approve of President Trump’s picks 100% for the Court Benches as he is selecting those who want to enforce the USA Constitution instead of re-writing We need to get USA back to being strong! As a conservative I applaud President Trump’s choice of GayleRego. I would give him a 100 % because he has fulfilled his promise to submit candidates for the supreme Court who are true Conservatves & believe in making decisions that meet the original intent of th Constitution. President Trump has been batting a 1000 on his judicial nominations. His love for America and our Constitution is inspiring. Let us pray that Congress will get behind him as we go forward. I would give President Trump an A+ for his judicial nominees. I certainly hope he gets an additional 2 years to select more judges who know and respect the Constitution. I originally voted for Donald J Trump because he promised to nominate CONSERVATIVE and CONSTITUTIONALIST JUDGES AND HE HAS HONORED HIS PROMISES WITH AN A+ RATING.The Dems can’t stop him now to impeach any judges not following the oath they take to to follow the US Constitution, especially those in the 9th Circuit. I believe that President Trump is doing an excellent job of placing conservative pro-2nd Amendment judges in position. Pro 2nd Amendment and enforcing the intent of the Constitution appointed judges is why I give the President an excellent rating. We badly need Constitutionalist Judges to protect and sustain American Great Life for generations. We also need Teachers and Professors who respect and teach the Constitution for generations to come. Tops as he’s nominated originalists to the best of my knowledge. CA fires: wasn’t it the Clinton Administration that stopped burning off forest-floor brush? In My opinion only, I study all who are choices for Justice, Gorsuch is a great choice, when it came to Brett Kavanaugh I really compared this choice to estate planning because, he is all things , did all things and understands all things, has great compassion, he is perfect…more important I Believed in him…I believed Clarence Thomas , so, Naomi Rao , perfect ! Congratulations to Justice ! I have a question regarding the FBI Director.Who gave this stiffs name to President Trump to pick as FBI Director. It looks like one of the worst nominations the President has made. Gayle Rego said everything I was going to say. So I will not repeat it. It is IMPORTANT that the rule of law and the Constitution of the US be applied!! President Trump is doing the job I had hoped he would when I casted my vote for him. I believe President Trump has done a great job in appointing conservatives as he continues to move forward and Make America Great again! Let’s pray that Congress will also move ahead and uphold the values set in our Constitution for the good of our nation. We need people like those he has chosen. Give him a top score. The President’s nominees will have an impact on our country in a positive way, We needed more judges at all levels of the federal judiciary who will apply the Constitution and not define the laws by allowing their personal beliefs to influence their opinions. I too agree with President’s nomination of Neomi Rao for DC’s Circuit Court of Appeals. We need to follow our Constitutional Laws and have the strength and fortitude to follow through with justifiable Consequences when they are broken. In my opinion, many of our Social problems are NO Consequences. Rudeness, disrespectful of the President, the White House and Tolerance for different points of view. The Left believe Laws are to be broken and with NO meaningful Consequences they have become an unruly MOB !!. Seriously?…. There is a difference between ‘Free Speech’ and ‘Hate Speech’ ! !….Hello !! So thankful for President Trump he is doing an excellent job. We need to support him and keep him in prayer. I have read all the comments. What can I say … I agree ! us. Very pleased with his choices. He is doing an excellent job and fighting hard to keep his promises to the American people. The only support he has really is from the American People. He didn’t get any from Ryan on several big items. Now with McCarthy following Ryan big hands will be in his pockets. I the face of unfair criticism, ridiculous challenges, anger, and out and out hatred our President Trump, not only does President Trump prevail his success dedevils his detractors. Myself, I have never thought it possible for someone who has negative articles written 9 out of ten times about him but all of his many successful actions in foreign affairs the economy and repair of our broken justice system go ignored. How President Trump and his family can hold up under all this I do not know but I pray he continues. His stellar understanding of the founders hopes for our checks and balances and the roll of our justices in it is a godsend. I pray every night for his strength to hold up. Since only President Trump’s Supreme Court appointments have received a lot of press, I can only go by what I have learned from Heritage and the Federalist, to judge his overall job. It is outstanding! Thank the Lord we still control the Senate, so his judicial appointments can continue. All is not lost. One of the main reasons that I supported Donald Trump was that I trusted him to pick conservatives as judges. His choices have been excellent in my opinion. President Trump is nominating judges who look to the Constitution as-it-was-written. He asks the right questions to the right people, when necessary, to gauge their perspectives against his. And when required, will call the shot on his own and bear its consequences. As a retired Marine, that’s the Leadership I look for. I am very pleased with his appointments/decisions. President Trump has a 100% score for his selection of court nominees. I hope the Congressional Republicans will Sen. Flakes scheme to oppose all of the President’s nominees — a childish temper tantrum. Flake is a weak-kneed, round-healed, wimp who is deathly afraid of women. Very thankful for this news! Nominates judges like our founding fathers would have. I am 100% pleased with all President Trump has been able to do in spite of the max effort by the Demon Rats to make it difficult for him. Mueller should turn his attention to Hillary if he was to find a crook. Great choice of nominees. Both follow the constitution and law. If it weren’t for his one bad nomination to the 9th circuit ,I would give him an A+ on his nominations.So far as I have seen, with the one exception, his nominees have all been true constitutionalists. I am very pleased with President Trump’s choices for Judges–great conservatives. Trump is doing well to appoint conservative justices. My reason for feeling this way is that we have a Constitution in name only – and I would like to get the Government off my back. President Trump has outperformed all the presidents of my lifetime with his judicial nominations plus his pragmatic businessman approach to administration and to diplomacy. We benefit from the legislation passed which has been constructive conservative, from his broad concepts such as rebuilding and modernizing our military, and from his fulfillment well over half of his campaign promises in 2 years. These accomplishments are in spite of Democrat hostility, never-Trumper-RINOs and the ever present deep state hurdles. Let’s forgive his faults, hope he restrains his tweets, and give Heritage Action all the help we can to support this effective President! Thankful for President Trump, for his excellent judicial choices, and for upholding our Constitution and our laws! God is merciful and faithful and continues to bless this great nation as we, under his leadership, return to the foundation upon which our country was established! I could not be more positively impressed with the Judicial Nominees President Trump has selected – due in part to the fine research and recommendations of Heritage Foundation, I believe. We pray for his continued leadership despite all opposition. I keep President Trump and the Heritage Society in my prayers on a consistent basis for the conservative work they continue to do in spite of the liberal left’s continuous barrage of complaining. Thank you so very much for staying true to our Constitution and to our American values. AND THANK YOU HERITAGE FOR YOUR GOOD WORK FOR AMERICA. PRESIDENT TRUMP IS MY HERO FOR MANY REASONS…AND I CERTAINLY DO NOT STAND ALONE. President Trump has done an excellent job with his judicial appointments. Keep up the good work. My husband and I are in agreement with the other already comments made. So pleased with his choice to fill Justice Kavanough’s open spot on the bench. The president has surpassed our expectations in nearly all his decisions across the board. He needs our prayers daily to continue the ongoing fight.He’s attacked by the left and fake media every day. i am very pleased with this choice to replace Judge Kavanaugh with Neomi Rao. Her credentials look impeccable. I love that President Trump is nominating judges that follow the constitution rather than trying to legislate from the bench. President Trump is making Judicial appointments who will support our constitution and the intent of our framers. Thanks you Heritage for your efforts as well. This is alright. We strongly support. I would give him an A plus, because I like conservative judges. Unfortunately, the judiciary has taken over from the the legislature on making laws in this country. By President Trump nominating strong constitutional judges we can reverse this trend. Trump is the first president to keep his word and appoint quality conservative justices, in addition to keeping his word on everything else. A for filling seats with folks who will follow the constitution. There are too many who try to rule by the bench. This is not in the constitution and it needs to be stopped. Why is the judicial branch being allowed to circumvent the other branches? This needs to be addressed asap! I would give him an A+! He is picking judicial nominees that not only espouse and champion Constitutionally sound,conservative principles,but are also immensely qualified.They will operate according to the Constitution,rather than their own feelings.They are much less likely to cave to modern,liberal standards in their rulings. We voted for now President Trump feeling that the potential for Conservative judges all across the land was possible ONLY with him. Any other outcome was the beginning of the end in our view. Thank you President Trump for keeping your promises! We pray even more will result from you becoming President. Thank you President Trump for listening to The Heritage Foundation when it comes to choosing nominees for the Judgeship of the United States. Keep it up. Heritage knows what they are doing. I give President Trump an A+ for his court appointments. This is probably the best thing he has done because they are lifetime appointments. Yay for our country. And a big thank you to Heritage for giving thorough and well thought out advice/education to President Trump and to our Senators and Representatives. This has been such a blessing for them and for our country. I am very proud of the nominees recommended by President Trump. I know that putting good conservative judges in as many positions in the court system is very beneficial to the conservative cause and for our nation. I would give President Trump the highest ranking for his selection in judicial choices because he is an originalist and not a deceptive communist progressive (DNC) bought and paid for Rothschild minion etc He is also doing almost everything without bi-partisan support. The first President to ever do such! Worthy of a place on Mount Rushmore. At this point in time … President Trump gets a 100%! He has done really well and even with the whole debacle of Associate Justice Kavanaugh … In the end, he was approved by the US Senate. Justice Thomas did the same thing and has proven himself time and again. I believe Justice Kavanaugh will do the same thing … Prove himself time and again. So far. I am very proud of President Trump’s record on almost all things that he has done, especially getting rid of most of the EPA stuff that was hindering our nation. I do not think our Founding Fathers would be upset with President Trump, at all … In fact I think they would be proud of him, as well. I thank God every day for President Trump and what he is doing for this Country of ours. The appointments for the courts are great and wonderful. Thank God that President Trump wants to do what the ordinary working people want done. Praise Lord for President Trump. One can see the hand of God working through President Trump. His judicial nominees are people who are honest, can withstand the lies and attacks of satan’s minions, and bring sanity back to the court system. I have almost given up on politicians in both parties, but by getting the courts back to ruling according to the constitution, Trump will have done the greatest favor to the USA. The Trump legacy will be his judicial appointments, but it may not be enough to save our Republic from the Progressive movement. I believe education is the battleground where our American Heritage will be determined in the future. Neomi Rao is an excellent choice. Thank you Heritage for grooming such excellent Judges. We are protecting our US Consitution for children. An excellent choice! An lndian-American Woman, married to a Hebrew. The melding of two brilliant minds!!! And for the DC Court!! My husband and I are behind President Trump 100%. We pray daily for him and his advisors and so appreciate that he consults with Heritage for guidance of choices. We are thankful for the conservative judges he is appointing. Wow! My husband and I whole-heartedly stand behind President Trump! We give him 100% on his judicial nominations. Thank you Heritage for supporting our President and protecting our Constitution. President Trump and the Heritage Foundation enjoy my greatest confidence. Thank you for your outstanding work, I appreciate all your efforts on behalf of all of us. To me, President Trump is doing an outstanding job. His sincere dedication to our country is inspiring. Also his belief in a strong moral base is something we have needed for a long time. He can tweet all he wants. I’m grateful he is there. This will correct America which has been ruled by political correctness, not by law. I endorse any judge that follows our Constitution. Neomi Rao has an impressive resume in her young life so is rated 100% in my book. President Trump has done, by far, the best job of any President in my recollection of selecting Judges! He finds strong Constitution believing/supporting Judges…with Heritage’s abundant help!! He gets a 100 from my wife and I!! No complaints, only the highest praise, With our continued prayers and support President Trump will be the president we have long needed to rock the boat, stir up the waters, and make the much needed changes in the way things are done in DC. Thank you Mr. President!!!! President Trump is doing all he possibly can with the nomination of quality justices. We have never been so buried in darkness, and corruption. We pra y for the protection of God’s mighty Angels, and the word of truth to be sought after for all those in positions of authority. Thank you for your part in helping our nations leadership by surrounding our president with encouragement, righteousness and justice. A+ for President Trump. I agree with him. Let’s make America great again. President Trump is trying to approve justices to our court system that respect the Constitution instead of those appointed by recent Presidents who believe they “make” the law! Border security for this country is very important –new citizens can’t simply walk in and declare their citizenship and voting rights. Remember too many Americans have died for our freedom to simply give it away!! A+ because he picks people who abide by the Constitution and the rule of law. The information from the Heritage Foundation is the best advice. Very good selection. I feel very confident about our president choice and hopefully things will continue to support our constitutional venue and rise above those who seek to revamp our liberties. God Bless our country ! I believe that President Trump’s nominees who adhere to the U.S. Constitution to the federal courts will have a most positive effect on our nation for decades to come. I applaud his choices to date and will continue to do so for as long as he holds the presidency. Great for America and great for righteousness in adhering to our great constitution. Generations will thank you Mr Trump. A+! PRES Trump continues to keep his campaign promises! On his way in my 81 year old mind to becoming one of the best PRES we have ever hadRight up there with George and Thomas and Abe! President Trump is doing what is needed! He is doing an outstanding job and I thank him for it. We give $50 every month and will continue to support his administration. God Bless Heritage and the Trump Administration! Great work by the President, as I see it! My husband I voted for President Trump, the Supreme Court was one of the reasons: His stance in supporting Constitutional judges, back him 100%. Seeing more balance of power! Doing what’s right for America. Wow! Thank you President Trump. He truly understand the importance of appointing judges who respect the Constitution. So grateful! I’m very pleased with President Trump’s court nominees. A promised made, is a promised kept. take. Stop wasting your time in D. C.
Thank you for all you do at Heritage! President Trump gets an A. All of his nominees have been originalists who respect the Constitution as written. by those who are only for their own power. him and his family . His choices for all justices have been excellent ! President Trump has done a fantastic job in his selections for the Federal Courts! He has always picked candidates that help protect our constitution. 100% bc he has kept promises to nominate from the list created before he won the highest office in the Land; & his nominees appear to have no hidden agendas, but are transparent about holding any decision made to the rule of law already in place. He is nominating strict constitutionalists who will adjudicate based on that document rather than those who would rewrite it to suit their own agenda. OUR PRESIDENT IS ONLY DELIVERING ON THE PROMISE MADE IN 2016, PRIOR TO BEING ELECTED TO OFFICE. HE IS THE ONLY PRESIDENT IN MY LIFE TIME THAT IS FOLLOWING THROUGH ON HIS PLEDGES DURING THE PRESIDENTIAL CAMPAIGN. 99.9% on President Trump’s recent nominations for our courts and other governmental positions! So impressed with our Heritage-trained folks! You can drain a swamp, but if you don’t quickly get busy planting new, productive crops, your efforts won’t last. Ohio history tells us all about that. Great work and great news for rejoicing. All are in our prayers. I am very, very thankful to President Trump for nominating people who will follow the law and properly apply the Constitution. This is very important because we have so many who want to avoid or misinterpret the law or the Constitution. We need Judges that believe in the Constitution of the United States. Thank you for recommending Conservative Judges to the Bench. We have been with President Trump from the beginning. He was our only hope to save our country from the evil left. He is always in our thoughts and prayers. We approve of those he has selected! Wow! I am so impressed with President Trumps integrity and intense focus on rebuilding our country with people dedicated to the qualities our country was built upon. I thank God for him and the people he is choosing. Trump gets an A for appointing people to the judiciary that believe the Constitution is the law of our land. President Trump gets high points from me. He is making wise decisions for the future of our children and grandchildren. He has the hardest job and the least respect in my history. I thank God for his strength and for his family. Thank you for appointing Rao. I give the President 2 thumbs up!!! Neomi sounds like just the kind of judge this country and its citizens desperately need! So glad he relies on Heritage for help in this area and that you do such a good job in vetting!! President Trump truly has a knack for staying positive and focused on what is best for the UNITED States. He gets high marks. He continues to select highly qualified individuals who know the law and the Constitution. He put up appointees that he said he would if elected and he kept his word and appointed from a list he published during the campaign which are conservative and constitutional judges. Very happy with President Trumps judicial nominees…. I just would really like to see some positive respectful appreciation for all he has and is doing! Greatest legacy of Trump’s administration will be his nomination of conservative judges for the Supreme and Appellate courts. The nominations I know about have been very good. They must have been as look at the uproar over Kavanaugh’s nomination by the criminal democrats in the Senate!. Now what he needs to do is SHOVE his current nominations through the Senate. Too bad McConnell is the Senate Majority Leader(?). On a scale of 1 to 10, I give President Trump a 20 for his judicial selections. I would have his back on any of his choices, especially when he is receiving assistance from The Heritage Foundation. It doesn’t get any better than that, PERIOD. I also give the president a score of 20. He is doing what’s best for America and us. Keep it up and stand firm on the wall. On a scale of 1 – 10, he gets a 10. We need as many constitutional originalists as possible on all of the courts. So far Pres. Trump has given us many, and with the Senate in Conservative hands I hope we shall see many more. Trump knows what is best for the U.S.
President Trump has kept his promises to Americans, especially when he nominates highly qualified candidates for these positions. I would grade his selections an A.
I think trumps judicial picks are excellent because they are constitutional conservatives. That will help our country remain true to its balance of liberty and government. That balance has been diminishing and was not too far from really encroaching on our natural rights. I would say Pres. Trump deserves an A+ for his judicial nominees, he still needs to push thru more before the dems take over and we still hold the Senate. As an Ultra Conservative Christian Constitutionalists, I give him an A+. If we don’t keep fighting, we will lose this Great Nation to the Leftist that have been sent to Congress. As for Me and My Family, we will serve our GOD, and his name is JESUS. He raised up this Nation, and we have 28 BIBLICAL Principles in our Founding documents to prove it. Stand up, and Stand behind our President. The best! Trump is getting it done to support America to it’s proper Constitutional core. My only comment is when the heck is he going to clear out the 9 Th circuit!?? I applaud the President’s picks 100%. We should soon see a turnaround in sensible, Constitutional jurisprudence, which explains the Left’s hysteria over Judge Kavanaugh. A+. He nominates judges who believe that the constitution as written is the law of the land. I think our President has & is doing a great job. I would vote for him again . We know we have Democrats who will not support anything he does, no matter how good it is .NOW , can you explain to us why the Republicans have no back bone to stand up for anything ? They are worse than Democrats because they collect the pay & benefits but do not do their sworn to jobs. Your record as president ranks you among the best US president ever—especially on judge nominees and hard stand on border security! May God bless you and keep you safe! trash that the left-wing throws at him! I agree with Darlene LaCroix. Could not say it any better! Excellent. Constitutional Originalists are essential to good jurisprudence. Even though Pres. Trump was criticized for his humorous description of Ms. Ford’s testimony against Judge Kavanaugh, that as much as anything helped the American people see the lack of credibility in her testimony. I’d give President Trump an A grade. He has consistently demonstrated his preference to install Constitutionally-minded judges. I wasn’t a Trump supporter in the 2016 Republican Primary but voted for him as the only alternative to Ms Clinton. I must say, I have been pleasantly surprised at his performance in office. His nominations to the Supreme Court so far have been good and from the list he put out early on, I think he will do well in the future. I would give the President a 10..I believe the choices that have been made are strong and right for our country. I give him A! He actually keeps his promises! I’m sooo thankful that Trump is our President!!! May he stick to his word in every circumstance! He gets an A+. Many of his nominees were on his list before he was elected. All of them have a record as constructionists, not activists bent on legislating from the bench. I would rate President Trump selection on judicial nominees as A+++++!I know he gets input from the Heritage Foundation which is the best source. I am very pleased with his selections. President Trump has given us great judicial appointments… I hope he gives us more! I personally think he is doing a great job as president. The fact that the Left pursued a destructive /crude Cavahaugh attack may suggest in and of itself that he was an excellent choice. His choices were superb and hopefully he will get to do it 1 more time before 2020. I would like to see President Trump end the taxing of SS on seniors when filing year end taxes. Implemented by Clinton. His appointments have been constitutionalist which is sadly missing, especially in the Ninth Circuit. I think he is doing a great job and so is Heritage. Creating a list during the campaign was brilliant!! President Trump gets an A+ for repeatedly nominating constitutionalist judges at every opportunity ~ we truly need judges who follow the law rather than try to alter or make new laws according to their own perspectives and off kilter views / goals!! High grades, the left doesn’t like his choices. Trump gets an A for Supreme Court nominations. Hope Judge Barrett is next. Agree with others about no taxes on SS. I would give POTUS Trump VERY high marks for his decisions, appointments, tenacity, & endurance, even when his own party leaders/members “waffled, caved, or just plain stalled” in their support. President Trump’s judicial nominees are men and women of integrity. Thank you Heritage Foundation for you valuable investment in this process. I believe President Trump is the most effective president in my 58 years. He keeps his promises unlike republican and democrat presidents alike. One of his most important promises is to appoint judges who will follow the constitution instead of legislating from the bench. Now we need the Senate to move faster on his nominations. U. S. at heart. Go Trump – MAGA!!! President Trump has consistently nominated and/or appointed solid constitutionalists to represent our country. I applaud him for that 100%. 10. Strict construction and the de-emphasis of precedent as holy has led to a fragmented SCOTUS with boundaries that have been blurred by poor precedent. Thoghthther everything should be fine. Excellent choices thus far. Nominating originalists/strict constructionists for the courts allows us to remain the Republic our founders intended. We are praying that President Trump will be able to continue putting Constitutional Judges in place. This country has strayed so far off it has been very worrisome. Our future is still on shaky ground, because too many are actively working against our best interests. Thank you for being here for our country .